Here in Switzerland and neighbouring region it is a speciality. Normally you buy some of the components already cooked as otherwise you will pass the afternoon and evening in the kitchen. 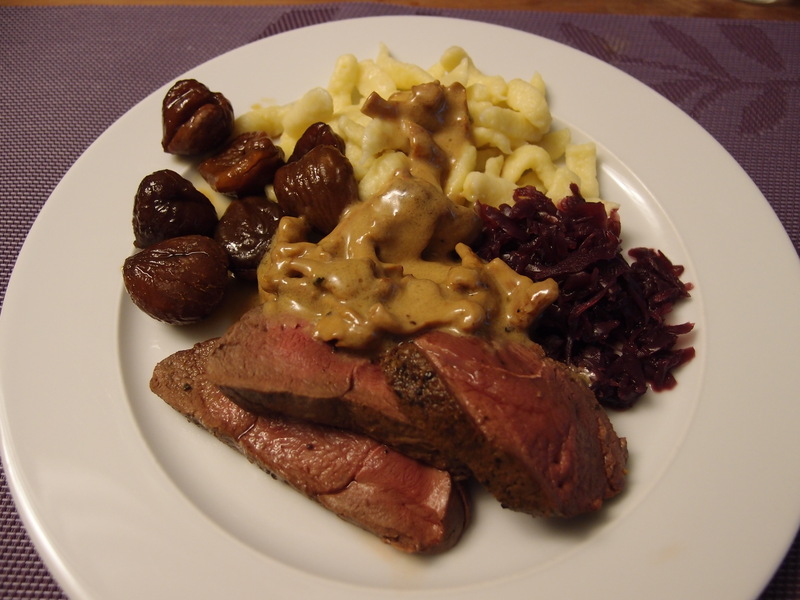 In this case I bought the Spaetzle (small sized kind of fresh pasta), the red cabbage (rot kohl) and the glazed chestnuts. 1 dl whisky (I used an older 12 years bottle Scapa). In a hot skillet add the olive oil, a little bit of the butter. Put the seasoned deer in the pan until nice and golden on all side. Wrap in a aluminium foil and put in the preheated oven at 210°C (mine was with grill function top and bottom). Leave it for ca. 17 minutes (depends from the thickness of the filet). In the meantime in the skillet you used before just add the concentrated game stock the chanterelles and let cooked a couple of minutes. Add the whisky and let go for another minute. Then you can add the cream and bring it to boiling point before lowering the heat. Add the butter and let cook until the meat is ready.